In 2007, responding to the abundance of talent he saw getting ignored in his home city of Chicago, Andrew Barber started Fake Shore Drive, a website covering Midwest hip-hop exclusively. 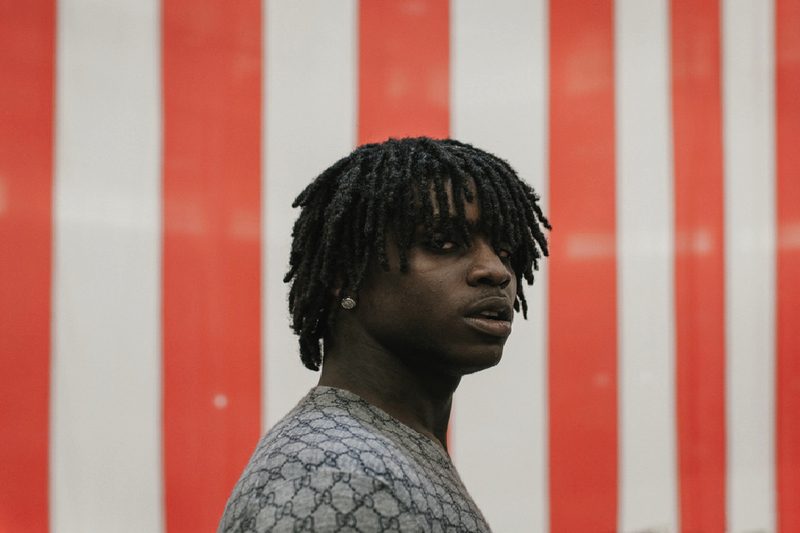 That focus would prove prescient: fueled by the breakout success of Chief Keef, whom Barber was among the first to cover, the city has demanded much of the rap world’s attention in recent years, with everything from its gruff drill music to DJ Moondawg’s hyper-positive bop style and dexterous lyricists like Chance the Rapper and Vic Mensa. But is the attention bubble soon to pop? If there’s anyone who’d know if Chicago has the talent to outrun the hype cycle, it’s Andrew Barber. What was it like when Chief Keef blew up? Keef caught everyone by surprise. I knew he was going to be big, but I don’t think anybody could have thought it was going to take off the way it did. It was the perfect story: he was this 17-year-old kid on house arrest in his grandmother’s living room. People buy into that. People love violence from the outside, when they don’t necessarily know what is happening in the city, or don’t really care. He is by far the most polarizing figure that I have ever covered. Some people were like, “This is great, because it’s bringing eyes to the scene,” but a lot of people were like, “No, this is very self-destructive; it’s only going to promote violence and gang activity.” I would get messages like, “Nobody has gotten a major label deal here since Lupe Fiasco, and the next person that does it is this pull-a-gun-on-a-cop guy?” It definitely was a weird time. When his debut album, Finally Rich, came out, he was in jail and there was all that negativity surrounding him, but at the same time he actually got an album out, and that’s more than a lot of people can say. How did the attention on him affect other artists? I like to call it the gold rush: all the labels came here. At the beginning of 2012, label people were calling me every single day, every week. Everybody wanted a drill artist, everybody wanted to sign Durk and Reese and Keef and Louie. At the same time, I was telling them, “No, you need to pay attention to Chance the Rapper.” A lot of these drill artists might have never played a show in their life, while Chance and Rockie Fresh were selling out shows for a year without any label attention. Do all the younger kids in Chicago want to be rappers now? Everybody is a rapper now. Everybody. People see it as the easiest way to become famous. A lot of people don’t even care about being national stars; they just want to be local stars. They want to be cool and be able to get into shows for free and not wait in line. I don’t think so. If anything, it might hurt nowadays. Anyway, there’s so many sub-factions of these gangs now. Some of these gangs might just be 20 to 50 people, and some might even be 10, 15. So, no: if it’s good, people will pay attention to it. Cream always rises to the top. How is drill related to the other scenes that’ve been thriving lately? Drill was covered so heavily, and that kind of skewed people’s view of the city. A lot of people would have put the death sentence on Chicago after Finally Rich came out, or with the JoJo thing [Chief Keef mocked the murdered teen rapper on Twitter before claiming his account was hacked]. They were like, “Chicago is just like Houston in ’05 or Oakland in ’06,” like it was a movement that was cool for a summer. Then, just when you thought it was done, here comes Chance the Rapper, who opened the door to all this other stuff, whether it be Tree or SaveMoney or Treated Crew or Spenzo or Lucki Eck$. This bop thing is really crazy too now, with Sicko Mobb, S.B.E., Lil Kemo and DLow. Drill really broke down the doors for a whole different class to emerge. It’s still going and new guys are popping up all the time. What can these artists learn from Chief Keef? That you can do it on your own. You don’t need a big budget, you don’t need a big street investor, or another kind of investor to put money behind you. He made the whole thing happen from his grandmother’s. He had real faith. He put on little high school concerts before anyone had even known about him. He had real credibility because those kids knew who he was. You can learn the same things from Chance the Rapper, maybe even more so. Before his first album, 10 Day, came out, he was going to every high school and handing out copies. He was like, “Hey, we’re going to give you early copies, just don’t leak it.” He gave out a thousand copies and nobody leaked it. Then he went to college campuses and sold concert tickets hand to hand. I think these are things that press can’t buy you, that the media can’t buy you, that record labels can’t buy you. That interaction made real fans. Do you think Chicago can be the next Atlanta? I hope Chicago will be like Atlanta—still going strong after 10, 12 years—but will that happen? It’s too early to tell. A lot of guys here get attention, but are Chicago artists dominating radio? Not yet, not at all. You just hope people are able to break nationally rather than just being a local phenomenon. Chief Keef was arguably the hottest new rapper in 2012, and I’d say Chance was the hottest new rapper last year—can we get somebody new for year three?